Today’s data platforms for Smart Cities should be taking on the toughest challenges of interoperability, information architecture and user complexity. But they’re not. We need to creatively evolve to an entirely new approach that avoids the confinements and limitations of today’s differing platforms. Join this live webinar with experts from Harbor Research, an IoT research firm and consultancy, to discuss why platform development for future smart cities is contingent on open data and improved data partnerships between technology vendors, OEMs, software innovators and governments. Freeing information from assets and systems for the user’s benefit, allowing stakeholders coming from various contexts to utilize the data they need to improve decision making, will be what sets the future for smart cities. Nick Jeambon is a Senior Associate at Harbor Research. He specializes in data-driven business and focuses on how new data from diverse real world systems and devices are shifting business models and customer behaviors. Nick has contributed in publishing reports on the impact of IoT across smart cities, telematics, energy, transportation, and industrial automation. Nick also brings extensive quantitative research skills to the and has helped define and refine Harbor’s Smart Systems market and forecast model. 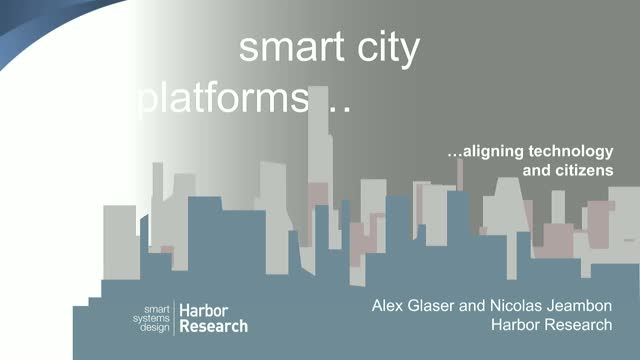 Alex Glaser is the Vice President of Harbor Research and an expert in smart systems thinking and design. Alex also helps lead Harbor’s Smart Systems Lab program – a real world laboratory where organizations can design, prototype, and test new models for delivering smart systems and services value. Alex brings broad client experience in strategy consulting, value chain analysis, and research development across a variety of industries including industrial, energy, manufacturing, transportation, smart cities and telecom.